Villa Makole is a vacation residence ideal for a small family, for double-dating couples, or for a select group of close friends. The areas and spaces are compact yet efficiently utilized. The amenities and appointments include only the basic, yet stylish, essentials that ensure utmost comfort, convenience as well as enjoyment. At Villa Makole, you will truly find the cozy ambience, exclusivity and privacy you desire for bonding or intimacy. The villa has two bedrooms. With king-sized beds and dedicated bathrooms, both bedrooms open out to the covered terrace and to the swimming pool area. At the center of the outdoor area is the eight-meter swimming pool. 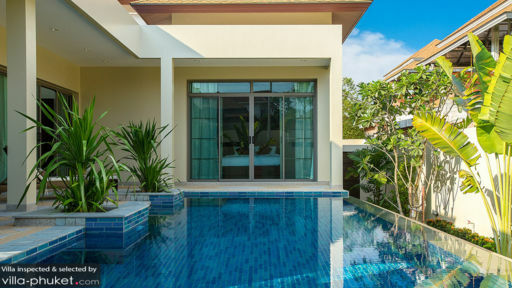 Accessible from almost anywhere you may be in the villa, the pool is all yours – anytime – for a soothing dip, aimless wading or splashy fun. Out of the water, you can lazily lounge on one of the cushioned pool beds under the shade of the covered terrace. Almost the entire indoor space is devoted to the living area. On the large and long couch fronting a widescreen TV you can all gather for your must-not-miss hit series. Adjacent to the back of the couch is the wooden table of the dining area. Good for six, you can, right here, feast on appetizing fare freshly cooked at the kitchen corner just behind the dining table. On duty to carry out regular services is the villa’s staff consisting of a housekeeper, a pool attendant and a security detail. 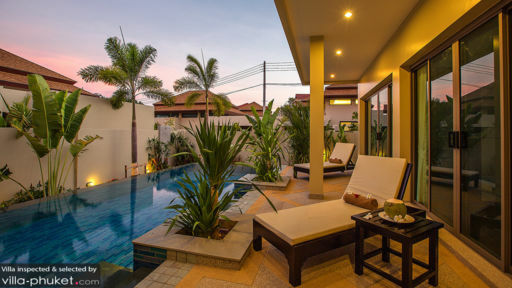 Villa Makole’s location is very close to Nai Harn – a white-sand beach fit for swimming. From here, you can also board a traditional Long Tail Boat for an island-hopping expedition of neighboring Ko Bon, Ko Kaew, Ko Lon, Ko Aeo and Ko Hae – which is also known as Coral Island. Also available at Nai Harn is a daily bountiful catch of fresh and delicious seafood. At Sala Loi, check out the local offerings as well as the traditional way of dining – from a mat on the floor. Other must-see attractions are the Phuket Shell Museum and Promthep Cape View Point for a glimpse of the magical sunset. Was a remarkable experience, we have enjoyed our stay, nice villa, fully equipped, beautiful decoration, total privacy. Highly recommended for families and couples.